Guys, guys, guys!! 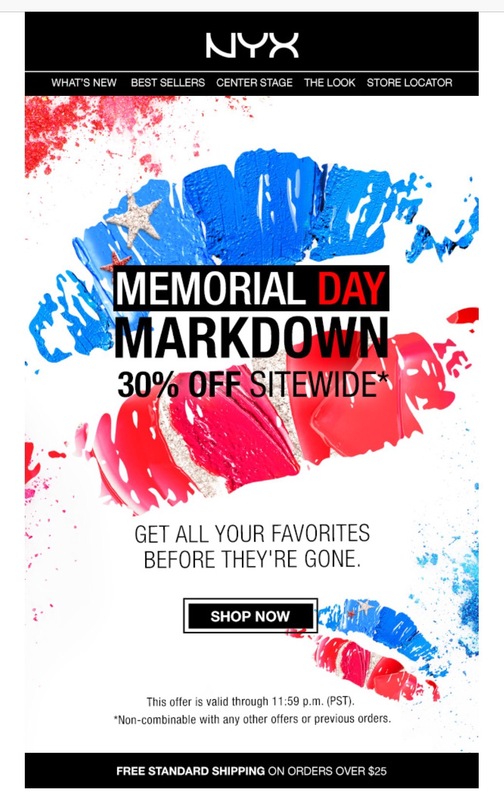 NYX is having their Memorial Day sale and the whole site is 30% off! Look what I got in my email! Don’t do like me and order $15.00 of stuff because you didn’t realize you get free shipping with $25.00 orders, ok? LOL My total was $20.00 and then I saw the fine print…fail. ALWAYS READ THE FINE PRINT! Can’t wait to share my stuff with you! I’m trying the new HD blush in Taupe for contouring, the Porcelain HD concealer, the Wicked Lippie in Betrayal (metallic purple), and the Primal Colors shadow in black. Two years ago during this sale I got a bunch of the slim lip pencils for around 2 bucks, so it’s a great time to stock up on those – they are awesome!